In 1911 the shipbuilding firm, Blohm & Voss of Hamburg, built a 4-masted barque for the German shipping company F. Laeisz. As was their custom the Laeisz Company selected a name starting with the letter ‘P’ and in this case the name chosen was Passat. 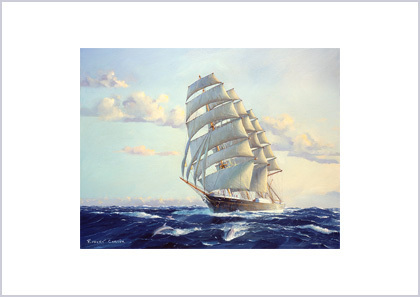 The English translation of this word is Trade Wind and this painting places Passat in the Trade Winds for which she was named. The wind strength is 15 to 20 knots, pushing up white caps and giving the sailer a good shove along, with the ubiquitous dolphin showing her their paces and sharing in the exhilaration of Trade Wind sailing. All those who told me of their time in sail, joyfully described the Trade Winds. As most of them were from British and Northern European backgrounds, the hot sun, clear days and almost effortless sailing provided a contrast to the cold greyness of their homelands. The Trade Winds, steady in strength and direction required that minimum adjustments to brace and sheet need be made..
Of course for the crew, there was no chance of lazing around in the sun, except on Sundays, and the working day progressed as usual. Instead, maintenance work required in the rigging and on the hull, presented itself, relentlessly. First of all, the heavy weather canvas used in the stormy North Atlantic and Southern Oceans, was replaced with, older sails. A 4-masted barque usually had eighteen square sails and about thirteen staysails and the process took several days. The sail-maker took advantage of this weather and new sails were marked out on deck and old ones repaired. Crew members were pressed into the task of stitching the sails, which was all done by hand. Aloft, rigging was replaced, stays painted and ratlines renewed and everything inspected for damage or wear, for after the Trade Winds came heavy sailing once again. The carpenter replaced or repaired damaged deck planks, pin rails and other woodwork and mixed the paint that would be used by the crew after the never ending job of chipping rust. After six years as an auxiliary sail training ship sailing to the East Coast of South America, Passat was withdrawn from service in 1957 and now lies at Travemunde, Germany, on public exhibition. She has been refurbished to A1 sailing condition. The 4 masted barque Passat in the Doldrums, pushing up white caps. 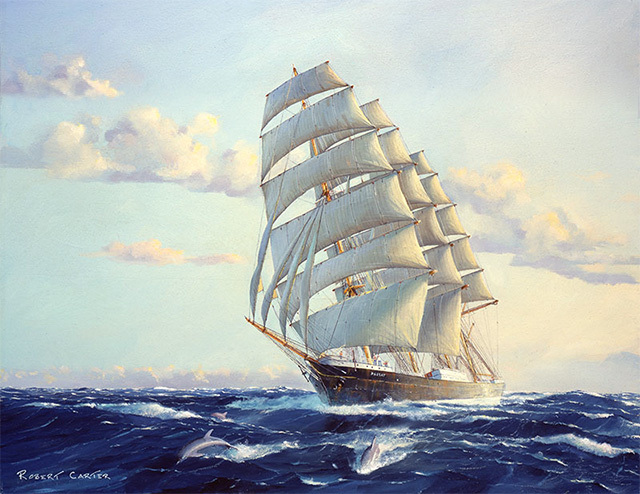 In 1911 the shipbuilding firm, Blohm & Voss of Hamburg, built a 4-masted barque for the German shipping company F. Laeisz. As was their custom the Laeisz Company selected a name starting with the letter ‘P’ and in this case the name chosen was Passat. The English translation of this word is Trade Wind and this painting places Passat in the Trade Winds for which she was named. The wind strength is 15 to 20 knots, pushing up white caps and giving the sailer a good shove along, with the ubiquitous dolphin showing her their paces and sharing in the exhilaration of Trade Wind sailing.